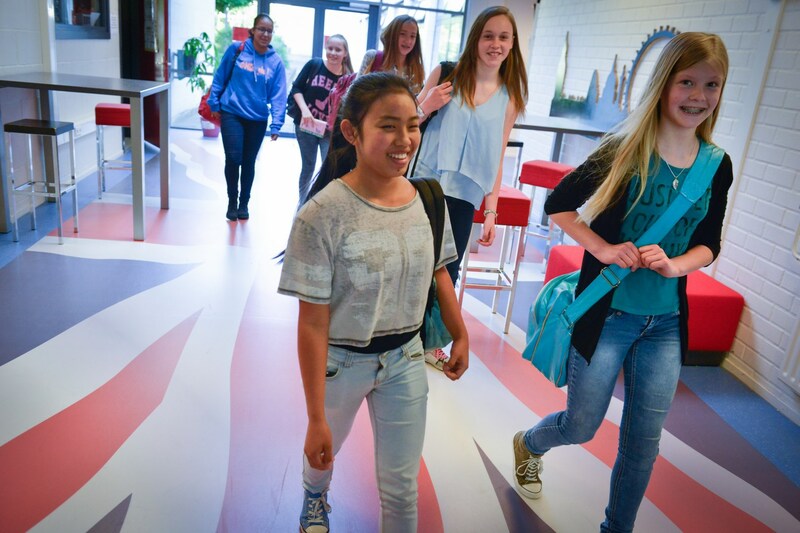 Carmelcollege is the only Secondary school in Emmen with a bilingual department. We have separate classes for mavo, havo and atheneum. Students do not only receive more lessons of English, but also more than half of all the other subjects are taught in English. On top of that students are introduced to all sorts of things that are quintessentially British or Anglo Saxon. Especially at the start this education requires extra effort. But we have learned that it takes only a short time before pupils become used to it. English is the main language of instruction at an ever growing rate of Universities and Colleges for Higher Education. English is the Lingua Franca: the language of science, the language of international business and indispensible in many Dutch and European companies and institutes. Students that have received bilingual education certainly have a head start due to their excellent command of English and their international orientation. They will feel right at home in Europe and beyond. What does Carmelcollege have to offer? At the mavo department more than 30% of the lessons will be taught in English. This is 60% at havo and atheneum. There will also be a large number of cross curricular projects. Of course you will receive a “normal” mavo, havo or atheneum diploma at the end of your 4, 5 or 6 years of bilingual education. Havo/atheneum TTO pupils will have the opportunity to take some internationally acknowledged exams like CAE (Certificate in Advanced English), CPE (Certificate of Proficiency in English), and International Baccelaureate English A2. These certificates will open doors to education at Colleges and Universities all over the world. It is also possible to receive exemption for certain subjects for students who have attended TTO. Mavo pupils will have the opportunity to take part in Anglia exams in the upper form. TTO is meant for mavo, havo and atheneum pupils who are looking for a challenge. Motivation and enthusiasm are very important. What do we expect of you if you want to attend our TTO? A mavo, havo or atheneum recommendation from primary school. Students are placed into the TTO department according to the LVS and advice from Primary school. Definitive placement in a billingual class will follow in June, when the CITO scores are known. A positive assessment of the linguistic competence by the primary school teacher. Willingness on the student’s part to spend extra time on homework. A pupil applies for bilingual mavo, havo or atheneum, by entry form or on-line. We handle entries in order of application. After application an introductory activity is held with every student. We pay attention to motivation and enthusiasm for bilingual education. We ask every candidate to write a letter of motivation in advance. The order of receipt of the entries in combination with meeting the requirements determines whether we can take on a student. If the classes are full, we will place a student on a waiting list. We will know if a student can be taken on in the third week of June. Students that cannot be put in TTO will be offered a place in a regular mavo, havo or atheneum first year class. TTO does carry extra costs with it. This money is spent on the CAE, CPE and IB certificates on study trips abroad and also on the extra TTO activities that are organised during the year. Click here for a overview school costs. It is possible to contact our TTO Coordinator, Ms M vd Wel. She can be reached through the general school number 0591-622870 or by e-mail. Furthermore you can take a look at tweetaligonderwijs.nl for some interesting information on Bilingual Education in the Netherlands.